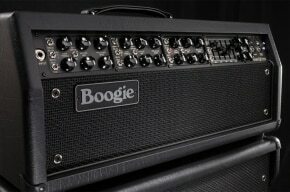 Once upon a time, Boogie only made one amp – now it’s a big family. Taking the F-50 as case in point, when you design an amp, how do you come up with something innovative and yet still retain the family sound we all know and love? Does the concept of a different tone come first with a blank sheet of paper, or do you start with existing building blocks and modify them until you find something new? “All of the above, some new, some old; an idea of the sounds we’re looking for but a willingness to let a design develop its own identity. If I didn’t enjoy the creative process I would have stopped long ago. But building high-performance vacuum-tube guitar amplifiers is my passion and my life’s work. For me, amp design is an evolutionary process, and I approach it a bit like music: I want to continue playing, learning and expanding. The process itself is artistically satisfying (if you ignore all the frustration and tedium!). And just as we assemble musical improvisation and speech by linking together known phrases, so too are amplifiers created using many previously developed circuit elements put together in new combinations. “The F-50 uses one of my favorite sounding front-ends and I finally figured out how to get it quiet enough to use in a powerful rig. Plus it’s got a new pair of old-time tone controls, a pre-set EQ for the Contour, a twisted hi-fi driver and the 50- watt output section. The trick is to get everything working happily together. 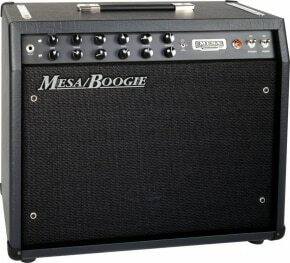 It’s a surprisingly versatile and familiar sounding amp for deviating so far off the usual path. “Most of my favorite amplifiers – including vintage Marshalls – can trace their lineage back to old Fender designs, not only because they established the tonal standard but because they just sound so musically right. But as I came up 30 years ago, I wanted to take what I had been repairing for years and try to kick it up to another level and satisfy the wishes I kept hearing from the players I knew. They weren’t all that stoked with what we would now consider vintage treasures. They saw sonic limitations and they wanted more from their amps. 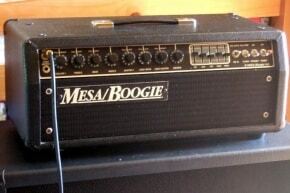 That quest led to the Mark I and to the introduction of high-gain from cascading preamp stages. There I did have a sound in my head, a sound more like a sax than a guitar. It didn’t go ‘plink, plink’, it had sustain and rich harmonic overtones to arrive at a lead voice. The Mark I, of course, lead to the Mark II, which introduced channel switching so that both the new high-gain lead sounds and the traditional clean response were preset-able and easily footswitchable. The basic architecture of the F-50 originated around 1980 and first appeared in our Studio .22 – a great sounding but noisy amp. It’s simpler and more stripped down than the Mark II and the basic arrangement more resembles the Mark I. But while the Mark I sounded great, it didn’t footswitch very well and this patented new circuit sought to overcome that limitation. And it did so partly by placing a huge attenuation pad right in series with the incoming guitar signal, a very bizarre thing to do. That’s the source of both the tone and the noise. This pad increases the clean headroom of the input stage and cultivates a curvaceous tonal response, bursting with freshness and bouncy dynamics. THE PRINTED CIRCUIT board layouts in all your amps have a very distinctive look. We believe they were once drafted by hand – are they still? “Yes. Thanks for noticing that ‘distinctive’ look. I still do them entirely by hand. Something like the Road King board can take a year or more to complete, but I think that process is part of the art. You’ve got to live with it. I use the old-fashioned black tape and donut pads on sheets of clear mylar. A typical board requires six clear overlays: the main three, the pad master, component side traces and solder side traces are connected together. The others are the nomenclature, hand-printed to identify each part; the drilling schedule for hole diameters and the routing layout showing the cut-outs, perforations and breakaways of sub-boards from the main board. “All of our boards are ‘plated through’ and ‘double-sided’. That means there are circuit traces on both top and bottom sides and, most important, each hole where a component lead is mounted is ‘plated through’ using a platinum alloy to form a small eyelet inside the hole’s circumference and connecting the top and bottom traces. This gives great strength and allows for easy service compared to the ‘single-sided’ boards normally used in guitar amps. There the mounting of parts relies mostly on the strength of the glue holding the foil to the board. They’re weak and hard to work on because you need access to both sides at once. I think some of the skepticism regarding circuit boards in amplifiers is the result of boards poorly done and not anything intrinsic. “Our ‘flying lead’ construction of hand-wiring pots and switches from the main circuit board blurs a lot of the distinction between point-to-point and our way – except we can achieve greater consistency because all parts and conductors are precisely located (part of the design process) and don’t vary. All Mesa/Boogies, from the very first, have used circuit boards and something like our flagship Road King would be nearly impossible to do at any price without circuit board construction. Curiously, I still use the very same X-Acto knife I’ve had for over 15 years. I haven’t even changed the blade because it’s been worked down to the right level of sharpness, dullness really, so it can work the tapes around corners in aesthetically pleasing curves without cutting through them. THE F-50 MAY look simple from the front panel, but there are all kinds of things going on behind it. Could you explain what the contour effect is actually doing on Channel 2, and what other tricks, if any, are happening with the EQ? “You’re right. We wanted to keep the F-50 as simple-looking as possible, but there is a fair amount going on inside. I started to discuss the pre-amp layout, and I think you could say it’s one that deviates most from a traditional Fender as far as the circuit and the arrangement of the main elements. WHAT’S WITH THE op-amps and discrete transistors on the F-50’s PCB? And what’s your opinion of mixing solid-state stuff with valves in guitar amps in general? “The two op-amps are parts of the recording/headphone circuit and the reverb circuit. Most of the transistors you see are there to drive the channel switching relays, or are for signal muting to mask the noise of the relays’ switching. Over the last several years I’ve been favoring relays over all other types of switching devices because they are so reliable and so predictable. Fully on or fully off there’s no signal loss and no bleed-through. And, unlike FETs, there is no amount of signal voltage they can’t handle. “The problem is, they make huge popping noises when switching on and off (remember the old Mark II-Bs?). To solve this problem, I came up with a mute circuit (patent pending) triggered by the relays themselves, that cuts off the amplifier just at the moment the pop would occur. I don’t think you can even detect the moment that the amp is silent, it’s that brief. And it sure beats a huge pop! 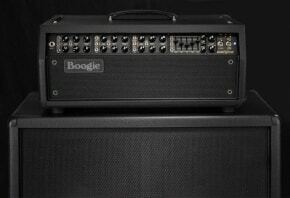 “In the F-50 the main signal path uses four 12AX7 dual triodes with two 6L6s for power. It’s all-tube from the input to the speaker jack except for the pre-set contour circuit and that goes all the way back to the Mark I. 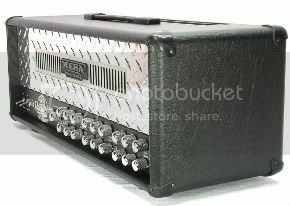 This isn’t one of those hybrid amps that are all solid-state except for a single ‘alibi’ tube. I’m pretty fanatical about tubes – in fact it’s all I know. I couldn’t even design a transistor amp. Yet I don’t see any sacred reason NOT to use some solid-state devices within a vacuum tube circuit… as long as they don’t compromise the tonality. “For example, the rectifier diodes in the high-voltage supply are solid-state. As you know, some of our more expensive amps let you select between silicon and vacuum tube rectifiers because there is a big sonic difference between those two: however, neither one is automatically ‘better’. But the only solid-state stuff that ever comes in contact with the actual signal path in our amps either contributes selectively to the voicing – like the contour or the reverb – or is sonically neutral, like the mute FETs. They’re ‘not there’ until that moment of switching. WHAT EXCITES YOU about the F-50 and how does it differ from previous stripped-down designs like the Caliber or the Subway? What about the Mark V?